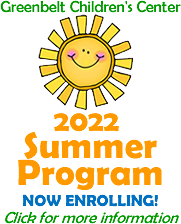 Please visit our Registration and Calendar pages for details. We look forward to a new year of exploration, growth and fun! Please join us in celebrating our renewed NAEYC Accreditation! In November 2017, The NAEYC Accreditation of Early Learning Programs commended "Greenbelt Children's Center (# 291482) for its outstanding efforts in maintaining and renewing NAEYC Accreditation." 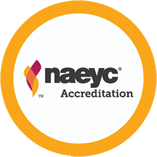 We proudly nvite you to view our NAEYC Reaccreditation report! In addition to the 40% Child Care Grant Subsidy, with additional subsidy available for a limited number of families that meet certain income requirements. Our Center has been awarded the highest score possible from Maryland Excels: 5 check marks! Congratulations to our outstanding faculty for providing such excellent care and striving to continuously improve the quality of our program! We love our children and our parents, and will proudly continue to make the GCC the highest quality program possible. We warmly welcome you and your child to Greenbelt Children's Center! At the Greenbelt Children's Center, we encourage parent participation. We believe it is important for parents and teachers to work together, as this benefits the child. We have an open door policy and parents may visit any time. You are your child’s first teacher! There are many ways you can help your child be ready for school. One way is to help your child with language & literacy. Learning to express needs & wants by talking, understanding others through listening and knowing about reading and writing are examples of language & literacy skills. Learning these skills begins at birth. Here are five important areas: building language skills, learning about books and print, developing comprehension (understanding), learning about letters and learning about sounds in words. When you support your child in these areas, he/she will be more likely to do well when starting school. Children who easily learn to read and write have had many experiences with books and language before school begins. As a parent, you can help build your child’s language and literacy skills and abilities. We are happy to be your partner in this and will offer parent learning opportunities so that you will become more skilled at being your child’s first teacher. four Maryland Excels Achievement Badges!